Nausha Russ and her 2-month-old daughter Aliza, were enrolled in the "Fresh Rx" program, which delivers healthy food weekly to food-insecure moms. A local food bank has teamed up with a north St. Louis hospital to offer a “fresh-food prescription” service for low-income, pregnant mothers. Not having access to healthy food during pregnancy can cause serious health problems for mothers and their babies. The need for healthy food is especially acute in St. Louis, where in some neighborhoods full-service grocery stores are hard to find. SSM Health DePaul’s OB Care Center and local food bank Operation Food Search partnered to create the “Fresh R-X” program. Doctors and nurse practitioners screen expecting mothers for food insecurity during checkups. If they find the women haven’t been able to afford food at any point within the last year, they’re given the option to enroll in the weekly delivery service for the duration of their pregnancy. The city’s 10.5 infant mortality rate is much higher than the national average. It’s even worse for black babies. In the city, African-American infants die at nearly three times the rate of white babies. Health officials have said increasing access to healthy food is a vital part of addressing infant mortality. Pryor said that before the program, she never asked patients if they were able to afford food. She said she was surprised to learn almost 40 percent of her patients worried about or had trouble affording fresh groceries. The food is delivered to moms or picked up at Operation Food Search's headquarters. The deliveries contain groceries such as barley, squash and fresh honey. An example of a "share" of food that would be delivered to expecting mothers enrolled in the "Fresh Rx" food delivery program. Not only does the delivery provide the food, it also gives instructions for how to cook it. That’s an important feature for people who might have not seen a spaghetti squash before, for example. Additionally, the food bank offers cooking and nutrition classes for enrollees and their families. Moms who use the program say even if they’re on government assistance, food can still run out. The weekly delivery lets her spend more time at the dinner table with her family, Russ said. It also introduced her to a lot of new food she had never cooked — such as barley and beets. 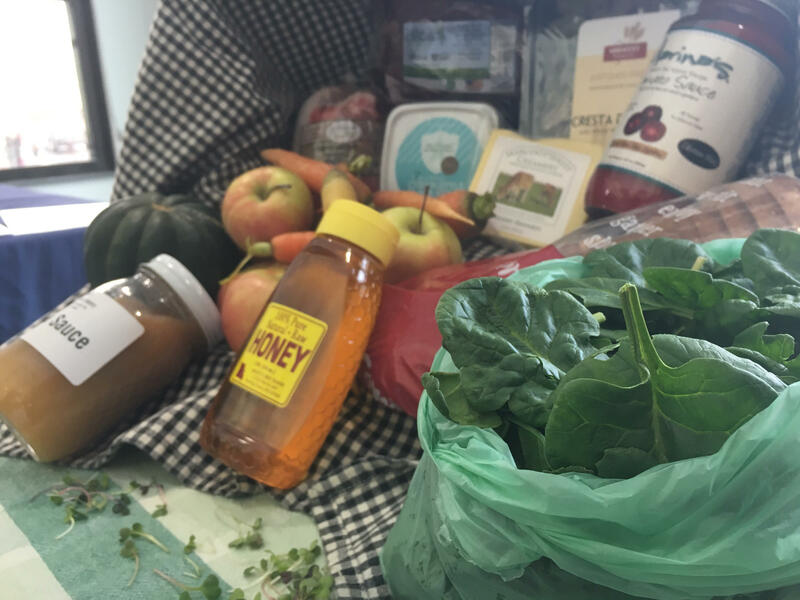 The food in the deliveries is all grown by local farmers and distributed through Fair Shares, a local farming network and delivery organization. At this point, 26 women are enrolled, but the program’s organizers say they hope to eventually reach 500 people through the program’s expected four-year run. They’re also hoping, with the help of Washington University’s Brown School of Social Work, to research health outcomes of women enrolled in the program. That could offer evidence that healthy food should be a reimbursable medical expense, said Trina Ragain, Operation Food Search’s director of research and advocacy. Grants from the Monsanto Fund and Anthem Blue Cross Blue Shield help pay for the program. Saint Louis University has announced it’s opening a food pantry to serve its students who lack access to healthy food. At lunch on a given weekday, students have no fewer than 18 different restaurants on campus to find lunch. Chick-fil-A, Starbucks, Subway and Qdoba are all visible on-campus brands. Clubs seeking members put pizza and cupcakes on display to lure potential recruits. In an atmosphere so saturated with food, many would find it hard to believe students are going hungry. But up to 10 percent of the university’s students don’t have regular access to healthy food, SLU Dean of Students Mona Hicks estimated. The number of infants in Missouri who die in their first year is slowly dropping alongside national numbers, but St. Louis’ infant mortality rate has remained nearly stagnant, according to the Missouri Department of Health and Senior Services.